Imagine that you lived in a world in which magical artifacts existed. Now, imagine that said artifacts suddenly went missing and were being held by nasty folks with bad intentions. What if you OWNED one of those artifacts and it was stolen right out from under your NOSE!?! You’d be devastated, right? To find it gone? I know I would be… I might even do anything to get it back. 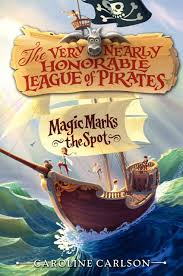 The main character in Caroline Carlson’s The Very Nearly Honorable League of Pirates: Magic Marks the Spot, is Hilary Westfield, a swash buckling, grog swilling, dueling girl pirate who wants nothing more than to enter into the Very Nearly Honorable League of Pirates (referred to, for the purposes of this review as VNHLP) but finds herself denied because she is a GIRL!!! Also, I guess it couldn’t have helped that her father is Admiral Westfield, the most anti-pirate admiral around. Admiral Westfield is very determined to pack his unruly young daughter off to Miss Pimm’s finishing school for delicate ladies, in an attempt to have her be the sort of hoop skirted, gossiping, high society girl that the majority of young misses would delight in becoming. Hilary, however, will have none of it and repeatedly tries to escape. One day, when masked robbers levitate a very old treasure map out of Admiral Westfield private study, Hilary sees her chance to get out of Miss Pimm’s and to show the VNHLP that she is perfect pirate material. It’s possible, however, that on the way she might poke her nose in a few things too big for her to handle alone. Good thing she has a few trusty sidekicks (doesn’t every girl pirate have trusty sidekicks?). 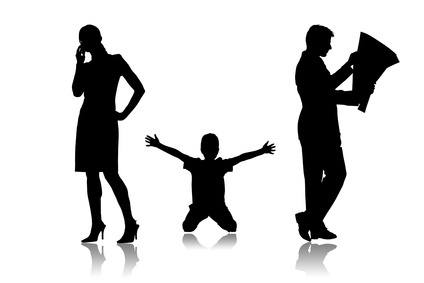 .Because they said so (what your parents would say:) nothing, nada, zilch, zip, zero… unless they find your running around the house wearing an eye patch, yelling ARRRRRR and brandishing a pretend cutlass disturbing.